At the Brighton v Millwall match today, there will be a full tribute to the life of Tony Millard, who sadly passed away last week. I’m not sure which magazine this cutting is from, although it’s probably Shoot! 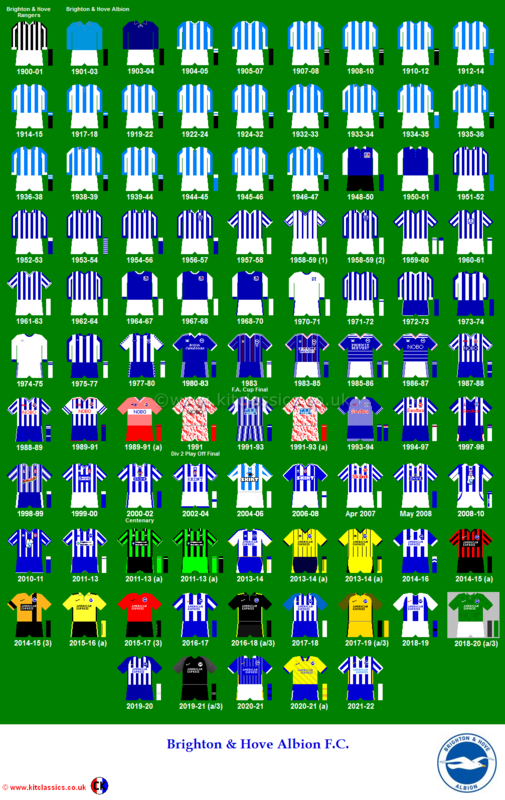 It covers the increasingly lucrative commercial side of the game of the late 1970s, with Albion doing a much better job than Arsenal at the time! As Brighton battle to win praise and points in their first season of First Division football, Alan Mullery’s other side are already top of their League! When it comes to making money for the club, commercial manager, Ron Pavey, and promotions expert, Tony Millard, have started a Goldstone Goldrush! This season, the Seagulls’ financial team look set to earn £600,000 from lotteries, promotions, club shop sales, programmes, ground advertising and TV fees. And that puts them above huge clubs like Arsenal, in the money game. 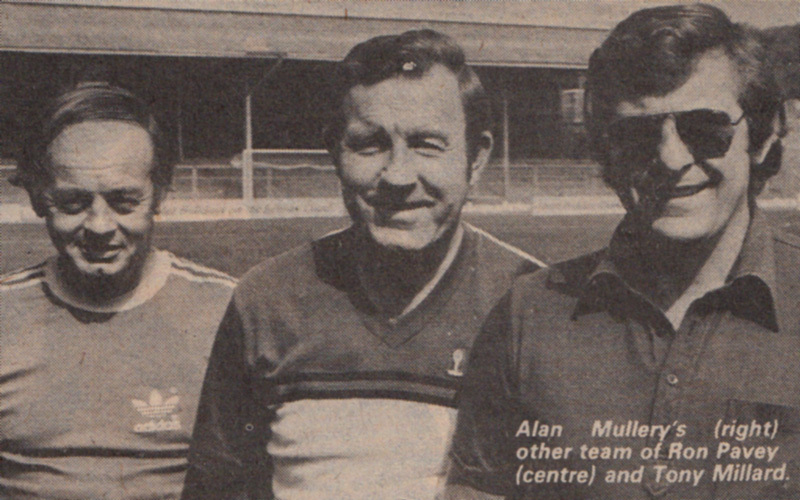 “You’ve got to have it,” says manager Alan Mullery, “because you can’t get your revenue back through the gate. We were averaging gates of around 22,000 at home last season. Now, that will pay people’s wages, but it won’t put any money in the bank for you. So the commercial side is very important. Mullery has seen Pavey and, more recently, Millard make great steps, since his arrival at the Goldstone in July, 1976. “At that time, the club was taking around £800 a week, from all sources. Now, it’s over £500,000 a year. So, what they’ve done on the commercial side has been fantastic. All right, our success on the field has been a help and people don’t really want to advertise and bring money into a club if it’s not doing well. But they’ve put in a lot of hard work. In the 1970s, even the commercial aspect of the game had a certain naive charm to it. 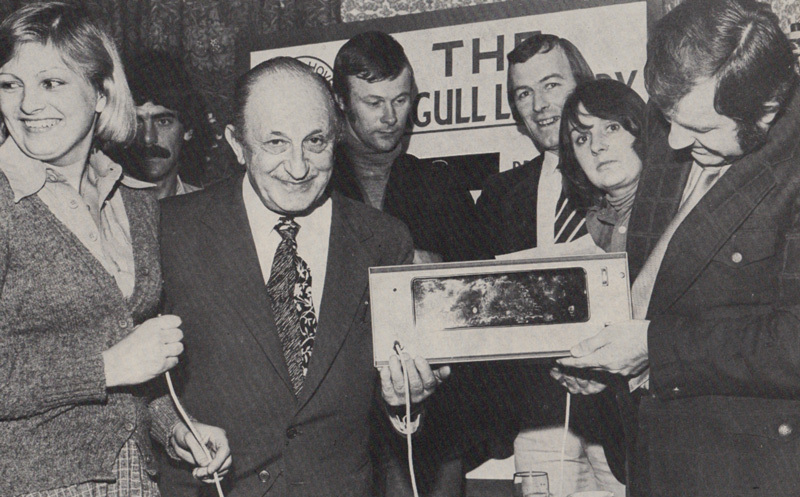 The Seagull Lottery was held weekly every Monday at a different venue around the county. 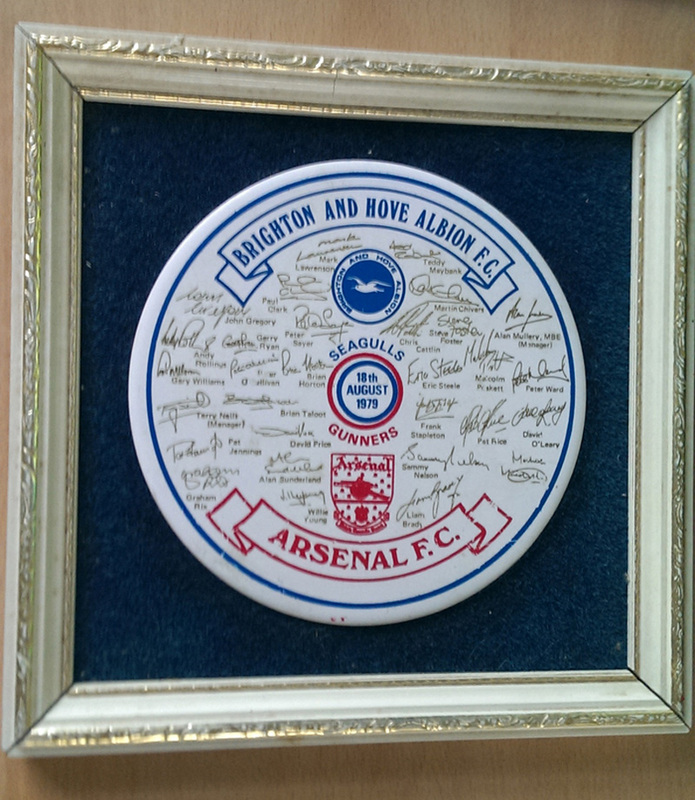 The second one was held at the Southdown Hotel in Worthing. That contraption is a lottery drawing machine. Very hi-tech, I’m sure! One of the biggest money-spinners at Brighton is the lottery system. The club runs two weekly lotteries and these produce a yearly profit in the region of £250,000. Ron Pavey is the mastermind behind this area of big business. When he joined the club, five years ago as commercial manager, Brighton were £200,000 in the red. Things have changed a little since then! “I think we compare quite well with the bigger clubs in the First Division,” says Ron. “We’ve made quite a lot of progress and we’re learning all the time. Being a small club helps us in a way. There’s more of a family atmosphere here. We’ve got a good team, working closely together. Tony Millard echoes that brand of positive thought: “Everyone knows football must be commercial to survive. All of us involved in the game love it. We all know football is the number one. But we also know it needs financial support and every aspect must be explored. There’s no doubt about that. Brighton toured America last summer. Like most lovers of the game, Mullery was irritated by the commercial circus that surrounds every match in the States. He knows British fans don’t want their Saturday afternoons dressed up in gimmicks and candy floss. But Brighton are proving to the soccer world that it is possible to milk the commercial possibilities, without any loss of dignity or pride. 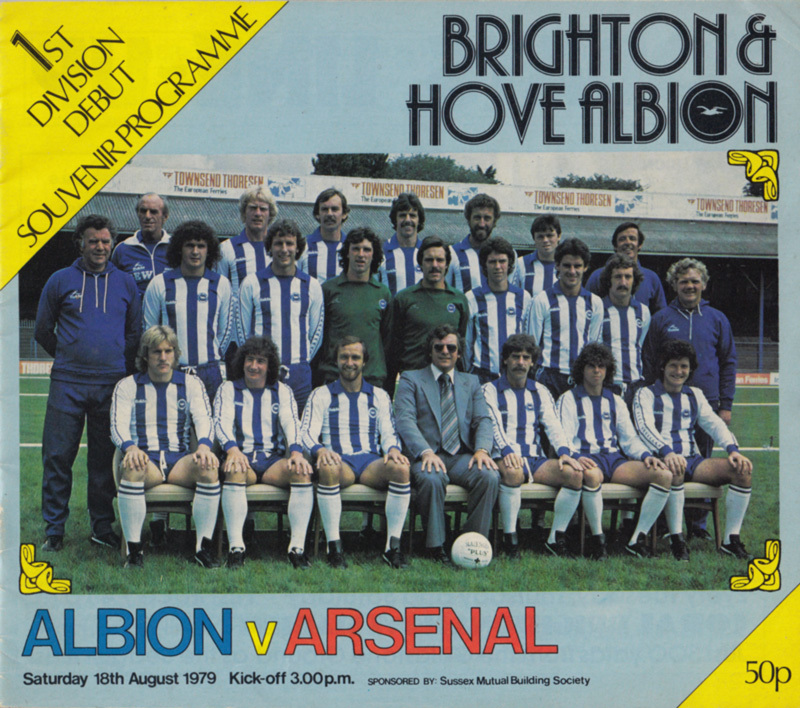 The special souvenir programme for the Brighton v Arsenal match, the Albion’s debut in the First Division, in August 1979. Price 50p. Sponsored by Sussex Mutual Building Society. I wonder what became of them.